Looking forward to the World Championship and looking at some future stars – who says the hockey season is done? After five straight defeats in the Eurotour, admittedly with various experimental teams, Ilya Vorobyov finally tasted victory with a 4-2 win over the Czechs in Stockholm. That wraps up the preparations for the World Championship on a high note. Russia’s win had a Trans-Atlantic flavor: three of the goals were scored by players who have finished their seasons in North America and come home to help the national team. Evgeny Dadonov, Pavel Buchnevich and Nikita Soshnikov were all on target, while Artyom Anisimov picked up an assist the day after he flew back to Europe. Earlier in the Swedish leg of the Eurotour, Russia lost to Finland in Helsinki before going down 3-1 to the host nation. Overall, the Russians came third across the four tournaments held this season. The KHL had 45 players involved in the four-team tournament. Danila Galenyuk. Ivan Morozov. Kirill Marchenko. Three names from this season’s KHL that might be worth remembering. The trio became the first players born in the 21st century to appear in the league – Galenyuk’s debut for SKA giving him the place in the record books – and finished the campaign at the World Junior Championship in Chelyabinsk and Magnitogorsk. For Galenyuk it was already his second appearance at the World U18s. 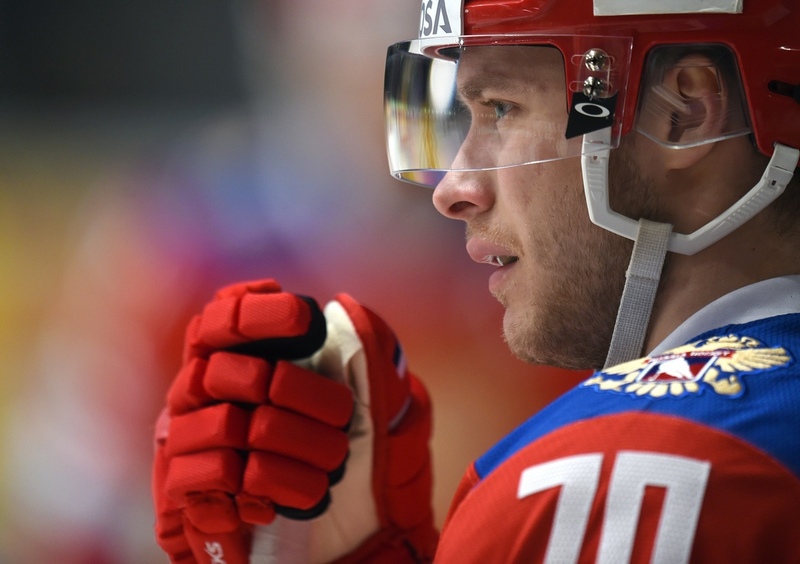 A year earlier, while playing in Ugra’s system, he helped Russia win bronze in Slovakia. This time, as one of the team’s leaders, the defenseman picked up two assists in five games and finished with +3 rating. Galenyuk has moved on to SKA, where he featured five times for Oleg Znarok’s team. His two team mates remained with Ugra. Morozov was a big player in the international tournament, collecting 5 (2+3) points. In the KHL, though, he has featured in just one game, getting 153 seconds of ice time against Traktor. Marchenko, Russia’s top scorer, had 6 (3+3) points. In the KHL he featured in two end-of-season games against Metallurg and Avtomobilist, averaging over 13 minutes of game time. With Ugra dropping out of the KHL in the summer, the two forwards will likely be appearing in the league in new colors next season. Even younger hockey players took to the ice in Sochi and Omsk in the Gazprom-Neft Cup, Europe’s biggest children’s hockey tournament. The final saw CSKA play Salavat Yulaev in front of 7,000 fans in Omsk, and they were treated to a thrilling game. The teams were tied 4-4 after overtime, with the Army Kids getting the verdict in the shoot-out. And, in the future, those 7,000 spectators might be able to recall how they saw another major star long before he was famous. The season is barely over but time doesn’t stand still. Already, clubs are working on their rosters for next season and some of the first contracts have been signed. At this stage, clubs are tying down players whose current deals are expiring. Lokomotiv confirmed extensions for forward Pavel Kraskovsky and defenseman Alexander Kutuzov, two of the young talents blossoming through the Yaroslavl system. In Moscow, CSKA will be keeping Canadian forward Greg Scott and inked a three-year deal with 20-year-old D-man Nikita Makeyev. Across town, Spartak moved quickly to secure Alexander Khokhlachyov’s services for another year. There was a shock outcome in Budapest, where Kazakhstan was bidding to return to the World Championship Elite Pool. In a hard-fought tournament, the Kazakh team – which is built around the Barys Astana roster – missed out on promotion by the narrowest of margins. After winning three of its five games, team Kazakhstan had to rely on Hungary defeating Great Britain in the final game of the tournament. A spot of Magyar magic would set up a four-way tie of teams on nine points, with the Kazakhs and the hosts taking the top two spots. It was looking good in the final minute, with Hungary leading 2-1, but a goal from Britain’s Robert Farmer with 15 seconds left changed everything. The tie put GB top of the group and back at the highest level for the first time since 1994. Kazakhstan, which had beaten Britain 6-1 earlier in the tournament, was left to try again next year. Italy, whose defenseman Thomas Larkin played KHL hockey with Medvescak, took second place. It’s all about the World Championship this week. Ilya Vorobyov names his Russia roster on Tuesday, and the team begins its campaign in Copenhagen, Denmark, on Friday afternoon. The first game is against France, and the Russians will play in an eight-team group that also includes Sweden, the Czech Republic, Switzerland, Slovakia, Belarus and Austria.